Gallery Hours: Wednesday – Friday 11-4, Saturday 10-5, Sunday – Tuesday by appointment. Joining Schiano are gallery artists Karen Hubacher, Claire McArdle, Zemma Mastin White,Leigh Wen, Katherine K. Allen, Anne Leighton Massoni and Deborah Weiss all presenting new work. Additionally, Massoni is welcoming several visiting artists many who are familiar and some new. Multi-talented Joe Karlik has been busy in his studio and will exhibit a new series of collages. Raphael Sassi and Sara Bakken were introduced to the gallery in 2007 in the exhibition, “The Next Generation.” Sassi exhibits regularly but this is Bakken’s first return. A Philadelphia based artist and graduate of the University of the Arts, Bakken works in blown glass and silk to create stunning otherworldly sculptures. Her work was recently featured in a juried exhibition at the 9th International Shibori Symposium at the China National Silk Museum, in Hangzhou, China. Blake Conroy, who dazzled us last year with his laser cut paper sculptures, recently had a one-person exhibition at the Adkins Arboretum. Conroy is exhibiting anew work utilizing his laser techniques but constructed in metal. And, two new Eve Stockton oversized woodcuts will greet visitors at the top of the stairs. New to the gallery are artists Elise Margolis from NYC; Rebecca Saylor Sack, a Philadelphia based painter who exhibits internationally and is a professor at the University of the Arts in Philadelphia; and Washington based painter Elizabeth Casquiero. Casquiero spent her early years in Portugal where she studied art before moving to Washington, DC to pursue a graduate degree in architecture. She is an adjunct professor at Georgetown University. 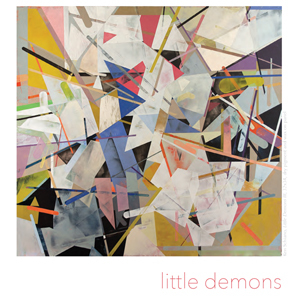 “Little Demons” opens on February First Friday, February 3, with a reception from 5-7:30 pm. Chestertown will be hosting numerous First Friday events so bundle up and join the festivities. Gallery hours are Wednesday-Friday 11-4, and Saturday 10-5. Private appointments may be arranged at any time. If you see the lights on, take a chance – the gallery will be open. There will a closing reception on March First Friday, March 3, 5-7:30 pm. For additional information and images of the exhibition.